As more people order meals delivered, foodservice supply chains chow down on speed, quality, and safety. Not too long ago, the only meal most people could get delivered was pizza. But today, consumers in major metropolitan markets can get anything from sushi to pierogies delivered to their home or workplace. Dining in is the new dining out, reports Cowen and Company. 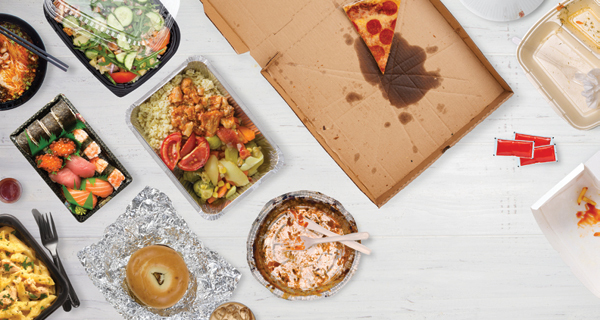 Restaurant meal delivery will grow from $43 billion in 2017 to $76 billion in the next four years, according to the firm's estimates. Cowen attributes much of that growth to an increase in online orders, which it says will account for three-quarters of delivery orders by 2022. The secret ingredient is technology, which makes ordering meals from a smartphone as easy as tap, tap, tap. One emerging restaurant delivery trend involves using offsite kitchens or commissaries dedicated to preparing phone or web meal orders. They're similar to pizza restaurants that only deliver. London-based delivery company Deliveroo is going where the diners are with Deliveroo Editions, a new concept that places meal-prep and delivery-only kitchens in locations that bring the food closer to consumer demand. The company's plans for 2017 included expanding the four London test kitchens to more than 30 by the end of the year. Each kitchen has space for five to 10 different restaurants. Restaurant partners provide the kitchen staff; Deliveroo supplies the delivery team. Future Editions kitchen locations could be based on consumer demand and restaurant availability. When analytics show significant demand in a neighborhood with just a few restaurants, that location becomes a target for a kitchen-only facility with cuisines not already available there. In the United States, Indianapolis-based ClusterTruck offers multiple cuisines from kitchen locations established in Indianapolis; Bloomington, Indiana; and Columbus, Ohio, specifically for delivery. The Indianapolis location serves up options from 14 restaurants offering everything from salads and burgers to Asian and Mexican fare. With a click or a tap, customers can sort the menu according to gluten-free, vegetarian, or vegan options. "The company has more control over meal preparation and delivery time because it isn't also filling orders for in-house diners," says Bernard Goor, vice president for consumer goods, retail, and food service at One Network Enterprises, a Texas-based cloud supply chain services provider. Let Amazon have its drones. Some restaurants are using robots to deliver food to customers. Robots that look more like motorized picnic coolers than R2D2 are hitting the streets in several cities in the United States and Europe. Manufactured by UK-based Starship Technologies, the company has tested them in 17 countries and secured approval in the United States for use in Virginia plus cities that include Columbus, Ohio; Washington, D.C.; Redwood City, California; and Coeur D'Alene, Idaho. The six-wheeled devices move at pedestrian speed along sidewalks within a two-mile delivery radius. They can maneuver around people and objects. Humans can monitor robot journeys. Each robot is about knee-high, weighs no more than 50 pounds, has better-than-smartphone GPS tracking, and nine cameras. The system sends the customer a text message when the robot arrives; it includes a code that will unlock the storage bin. In early 2017, the company announced it was partnering with Domino's Pizza Enterprises to launch robot pizza deliveries within a one-mile radius around Domino's stores in selected German and Dutch cities. "With our growth plans over the next five to 10 years, we simply won't have enough delivery drivers if we do not look to add to our fleet through initiatives such as this," says Don Meij, Domino's group CEO and managing director in a press release.